The Michigan basketball team doesn’t have Glenn Robinson III anymore. The forward scored 17 points — including a game-winning bank shot at the buzzer — against his father’s school the last time the Wolverines played Purdue in West Lafayette. Robinson’s performance capped a furious comeback from Michigan, which had trailed by 19 in the first half. Coach John Beilein knows his team can’t afford to fall behind like that Saturday. They simply don’t have the experience to overcome such a big deficit on the road. One encouraging sign Beilein expressed is that Michigan appears to have adopted a newfound tenacity during practice. In the Big Ten opener against Illinois, forward Aubrey Dawkins came off the bench and scored a game-high 20 points, which the coach said has helped motivate the other freshmen. Recently, instead of running an eight-man rotation against the scout team, Beilein said the Wolverines are splitting the top-10 players into teams and competing against each other, giving more people the opportunity for meaningful minutes in practice. The coach pointed to Dawkins and Ricky Doyle as examples of players who have improved most in recent days, in part because of that change. “Aubrey was the first one that really benefited out of it,” Beilein said. But as much as Doyle and Dawkins have improved, both are still inexperienced on the road. The Boilermakers run their offense through a pair of 7-footers, Isaac Haas and A.J. Hammons. Haas is averaging 11.1 points on 62% shooting, while Hammons has picked up 10 points per game and remains a shot-blocking force. “The big fella there [Haas] is 7-2, 300 pounds,” Beilein said. “He’s built like Max, only he’s 7-feet-2. Guarding him is really going to be a challenge. 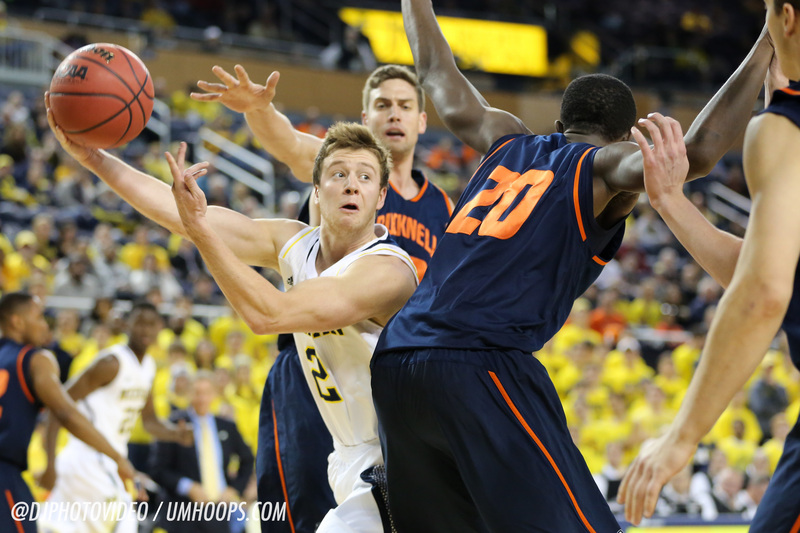 Friday’s practice focused on how the Wolverines can stop the Boilermakers’ big men. Dawkins’ big afternoon against Illinois came at the expense of Derrick Walton, who played just 10 minutes in the second half — and none in overtime — and shot 0-for-8 from the floor. Friday, Beilein suggested that Albrecht could earn his second start of the season Saturday, and that the decision could be made based off how the sophomore feels during warmups. “We’re prepared to go either way,” Beilein said. The coach reiterated Friday that Walton’s toe injury continues to impact the sophomore guard. Beilein also confirmed that Walton hasn’t suffered another injury besides the sprain, which occurred against Villanova on Nov. 25. “I personally think that has set him back,” Beilein said. “I thought he was playing pretty well, and then it took his timing and things like that. That’s been a big thing. We’ve been trying to get him healthy to get his confidence back. Albrecht, who is dealing with an undisclosed injury that could affect him all year, said he feels “a lot better” than he did before Winter Break.